On 12 December 2015, in Paris, France, the 21st session of the Conference of the Parties (COP 21) to the UNFCCC adopted the Paris Agreement, a universal, legally-binding agreement to take effect from 2020. 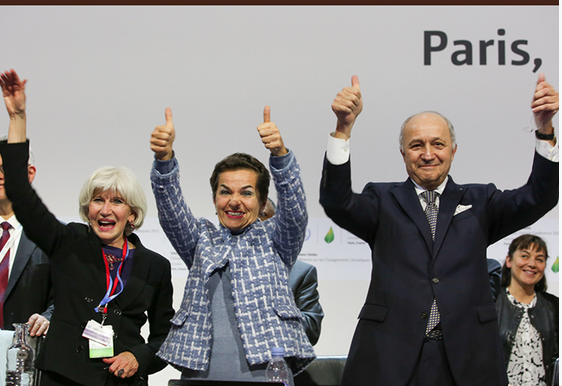 Commenting on the new Agreement, COP 21 President Laurent Fabius, Foreign Minister, France, stated, "The Paris Agreement allows each delegation and group of countries to go back home with their heads held high. Our collective effort is worth more than the sum of our individual effort." Leading up to the adoption of the agreement, the two-week Paris Climate Change Conference centered on advancing negotiations on the Paris outcome, including an agreement and the associated decisions, to fulfill the mandate outlined in Durban, South Africa, at COP 17, “to develop a protocol, another legal instrument or an agreed outcome with legal force under the Convention applicable to all Parties” to be adopted at COP 21. A leaders event, which brought together over 150 Heads of State and government, was held on Monday, 30 November 2015, to generate political will towards an agreement. During the first week, work concentrated under the 12th part of the second session of the Ad Hoc Working Group on the Durban Platform for Enhanced Action (ADP 2-12), which considered crosscutting issues and items not associated with agreement articles in a contact group, and established spin-off groups to work on the text of individual articles in the draft agreement text and their associated decision text, as well as decision text on pre-2020 ambition. Following the closure of the ADP on Saturday, 5 December 2015, and the transmission of the ADP’s outcome to the COP, the “Comité de Paris” was established under the COP 21 Presidency to continue work to advance progress on the draft agreement and decision text. Minister-led indabas, bilaterals and other consultations took place under the Comité de Paris during the second week of the Conference. The Comité de Paris convened on Saturday, 12 December 2015, for the presentation of the final text. After consultations by groups of parties, the Comité de Paris reconvened in the evening to forward the final text of the Paris Agreement and associated decision to COP 21. At 7:26 pm, COP 21 adopted the Paris Agreement and associated decision. The Agreement includes 29 articles. Among its articles, the Agreement aims to strengthen the global response to climate change, including by holding the increase in global average temperature to well below 2°C above pre-industrial levels and to pursue efforts to limit the temperature increase to 1.5°C above pre-industrial levels. Under the Agreement, each party shall prepare, communicate and maintain successive nationally-determined contributions (NDCs), which shall be communicated every five years. The Agreement also establishes a global goal to enhance adaptive capacity, strengthen resilience and reduce vulnerability to climate change. The article on loss and damage provides that parties should enhance understanding, action and support, including through the Warsaw International Mechanism on Loss and Damage associated with Climate Change Impacts (WIM). It also indicates that developed country parties shall provide financial resources to assist developing country parties with respect to both mitigation and adaptation, and other parties are encouraged to provide or continue to provide such support voluntarily. The Agreement establishes an enhanced transparency framework for action and support. The COP undertakes a global stocktake in 2023 and ever five years thereafter, to assess the collective progress toward achieving the purpose of the Agreement and its long-term goals. The Agreement will enter into force on the 30th day after the date on which at least 55 parties to the Convention accounting for at least 55% of total global greenhouse gas (GHG) emissions deposit their instruments of ratification, acceptance, approval or accession. The Paris Climate Change Conference convened from 29 November to 13 December 2015, in Paris, France. It included COP 21 and the 11th session of the Conference of the Parties serving as the Meeting of the Parties to the Kyoto Protocol (CMP 11). The 43rd sessions of the Subsidiary Body for Scientific and Technological Advice (SBSTA 43) and the Subsidiary Body for Implementation (SBI 43) also met.